NES The Quest of Ki (JPN) "warps" in 02:27.51 by fsvgm777, ruadath & TaoTao. 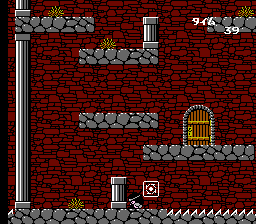 The Quest of Ki (カイの冒険) is a video game developed by Namco in 1988. It is part of the Tower of Druaga series (in fact, it serves as a prequel to the series). The player controls Ki, a priestess sent by Ishtar in order to retrieve the Blue Crystal Rod, which was stolen by Druaga. fsvgm777, ruadath & TaoTao use warps to skip most of the regular game and get to the regular ending at floor 60 in 2 minutes and 27.51 seconds, an improvement of 1.18 seconds over the previous movie.